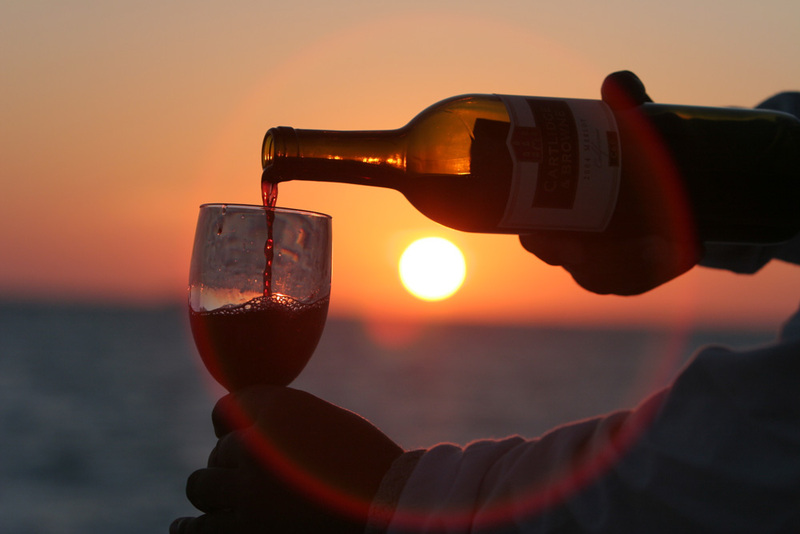 View the sunset sail key west with a bottle of wine and partake on imported cheese with your loved one. Set the romantic mood for your special someone aboard our 65’ sailboat as you catch an unobstructed view of the Key West sunset. Our highly acclaimed Wind and Wine Sunset Sail Key West tour offers an exclusive trip for couples or friends who wish to spend a relaxing evening away from the city noise. Listen to the whistling wind as it hits the sail and hear the splash of the water as it reaches the beam. Book ahead with us and experience a night that you will never forget. The Wind and Wine Sunset Sail Key West commences in the evening when our well-maintained boat leaves the marina. The 65’ sailboat is operated by our seasoned captain, who is supported by qualified crew members. Take part in the activities on the boat by volunteering to help raise or lower the sail. You can experience the operation of the sailboat with helpful instructions from the crew members. Feel the luxury of life while the crew pamper and serve you with rounds of wine or champagne. Not only will they serve you, they will also give you a brief background about the wine and champagne served. To pair with the wine, our crew will serve you a variety of imported cheese, hors d’oeuvres, and fruits. Get ready to sample no less than 8 different kinds of wine and 5 different kinds of local and imported beer. You might think you’re in Napa Valley wine tasting or in Germany celebrating the Oktoberfest while viewing the sunset in the middle of the sea. Our exclusive two and a half hour tour accommodates less than 30 people to ensure special and personal treatment on board. You can make it more exclusive by having the sailboat all to yourself and your loved one. Just make the arrangements with one of our agents. Or if you feel friendly and would like to meet new people, you can share this experience with other couples. Either way, we assure you of an evening with privacy and personalized service. 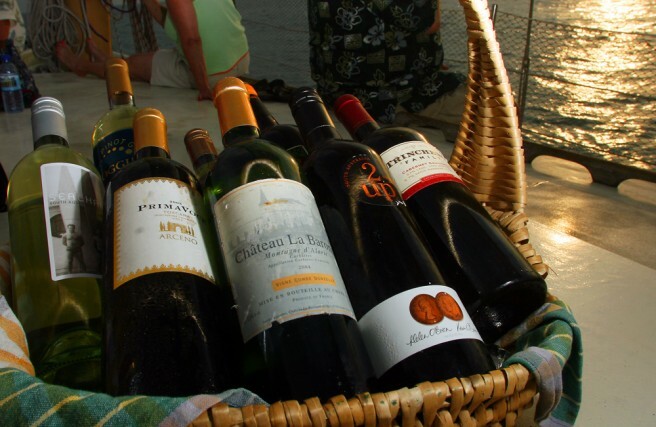 Realize your “champagne wishes and caviar dreams” when you take our Wind and Wine Key West Sunset Sail tour. Don’t wait any longer. Plan your romantic trip to Key West and book our Wind and Wine Sunset Sail Key West tour. You will not find any other charters that offer the same kind of tour with the same kind of service at such reasonable rates. Booking online is hassle-free and secure. Once you confirm your booking, expect to receive a confirmation voucher from us. That voucher contains all the details of your tour and the suggested items that you need to bring on board. Make sure you arrive at the marina 30 minutes before the tour and get ready for the times of your lives. Visit our website now! Are Non Alcoholic Beverages Served Onboard? Yes. We serve. water and Cocoa Cola products. Is There An Age Limit To Do The Activity? No there isn't. Minors are accepted on the Wind and Wind. Minors between the age of 6-12 are charged child fare and 13+ are charged adult fare according to the National Coast Guard Regulations. What food and drink is served? Choose from up to 8 different types of wine from around the world (taste through them all, or just choose your favorites) Choose from 5 different types of beer. ( import and domestic) Enjoy a wonderful variety of delicious appetizers like Havarti Dill, Smoke Gouda and Summer Sausage, Caprese Skewers, Water Crackers with Brie, Green Apple with a Honey Drizzle, and more.